Doris Day made her first solo recordings in early 1947. She recorded mainly for Columbia Records, although she cut non-commercial transcriptions for Standard Program Library, Capitol Records, and Armed Forces Radio Service (AFRS.) Most of her early recordings were issued on the Columbia Red Label as 78’s, 45’s and 33 1/3 rpm singles. In 1949 Miss Day cut her first album, a 10″ LP titled You’re My Thrill. She continued recording both singles and albums on the Columbia label until 1967. The joy of collecting Miss Day’s singles and albums was further augmented by Bear Family Records of Germany. They issued between 1992 and 1997 a total of four boxed CD collections which included every song Miss Day recorded for Columbia Records. Topping that feat, Bear Family Records discovered and included in the various boxed sets previously unknown tracks and different versions of known Doris Day songs. See Chapter 9 – The Bear Family Records of Germany Boxed Sets (1992-1997). 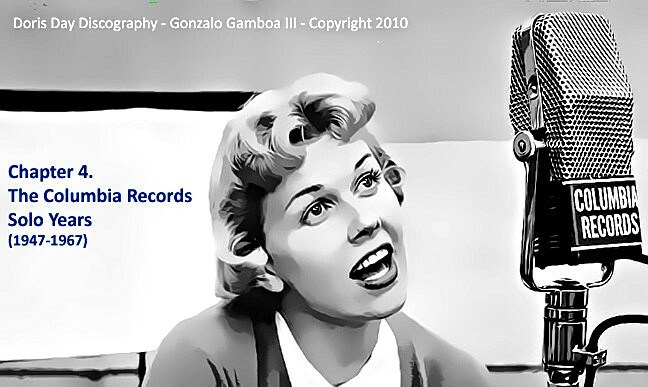 This section of the discography includes all the known commercial Doris Day songs in single and album format. It also includes in chronological order non-commercial tracks which were made for use in radio shows and other musical venues. These include transcriptions for Standard Program Library, Capitol Records, Armed Forces Radio Service (AFRS), Victory Discs (V-Discs), and other transcription formats. 4-39596 If That Doesn’t Do It! Legend: 37000 (Catalog # for 78rpm; 3-37000 (33 1/3rpm); 4-37000 (45rpm). Number in parenthesis (i.e 1-109) is number for 33 1/3 rpm microgroove single with small spindle hole. The Stereo Singles under the S7 31 series were released under the label “Stereo LP Seven”, and were contained in boxed sets distributed to disk jockeys. There were at least five singles under this series and were double sided singles from the album “Bright and Shiny”. This does not include the stereo single containing “The Sound of Music” and “Heart Full Of Love”. (1) Mellomen & Orchestra Conducted By George Wyle (ZSP 32599). (2) Page Cavanaugh Trio (ZSP 32598). Reissues on Columbia “Hall Of Fame” Label. Issued as 78 rpm with 5-digit catalog number, and as 45 rpm, with catalog number beginning with “4-” or “13-“. Note: This section shows only original studio or sound track albums. It does not include any Columbia compilation albums – that is, albums that are either collections of previously released Doris Day songs or that include her recordings with those of other vocalists. The number in parenthesis after the album’s catalogue number is the year of release. These LPs were also released as boxed sets, either with 78 rpm discs or with 45 rpm discs. As shown below, the catalog number for the 78 rpm discs consists of a five digit number, while the 45 rpm discs are preceded by “4-“. 38954 Oh Me! Oh My! Oh You! 39622 Ain’t We Got Fun? 39974 Ain’t We Got Fun? Let It Snow! Let It Snow!! Let It Snow! EP SEG-7546. The EP’s differ from the boxed sets. The boxed sets were rather cumbersome especially those vinyl discs which played at 78 rpm. You will note the record numbers for the boxed sets are shown under the particular 10″ or 12″ LP above from which they were derived. Disc #5-1081 Ain’t We Got Fun? Disc #7-2453 Once A Year Day! *Note: The track “He’s Such A Gentleman” features The Page Cavanaugh Trio and was never released in the United States. Harmony is the budget line label for Columbia Records. The albums do not contain the usual 12 tracks found on Columbia Records LP’s and contain previously released song tracks. The catalog number beginning with HL signifies the monaural version and those beginning with H, HS and KH signify the stereo version of the particular LP. F. Columbia Records LP Reissues. Columbia Records repackaged previously released Doris Day tracks under the banner Collector’s Series. These reissues were usually 12 inch LP’s. 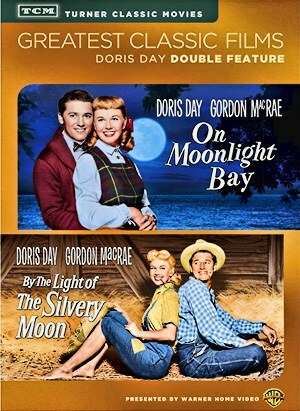 More recently many of Doris Day’s original recordings have been reissued in audit Compact Disc (CD) format. These are not detailed in this section, but are contained elsewhere in this discography if the CD’s contain previously unreleased Doris Day tracks. G. Columbia Records Special Products. Columbia Records issued a variety of LP’s which consisted of compilations of previously issued Doris Day tracks. These products were specialty items for commercial businesses such as Goodyear and Zenith. There is noting of interest to the Doris Day collector except for the photos and artwork of the LP liners. These items have recently become available through Ebay and other sources, and the sellers ask more than their worth, especially since the contents are previously issued tracks, and at times the LP’s were given away. CSS 1429 That Christmas Feeling!